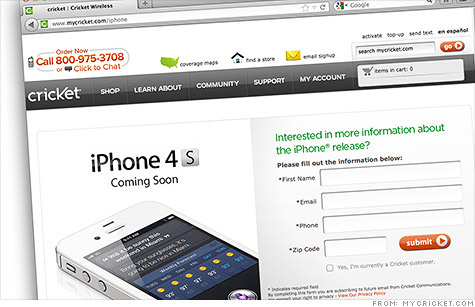 You can now have a contract-free iPhone 4S -- for $500. NEW YORK (CNNMoney) -- The iPhone has been for sale on all three of the largest U.S. cell phone networks for eight months now, but it hasn't been offered to the fastest growing segment of wireless customers: those without contracts. Until now. Regional carrier Cricket, owned by Leap Wireless, announced Thursday that it will sell the country's first pre-paid iPhone beginning on June 22. Pre-sales will begin online June 15. Cricket customers will have to pay nearly full price for the device, shelling out $500 for the 16 gigabyte iPhone 4S or $400 for the two-year-old iPhone 4. That compares to a $200 upfront cost on Verizon, Sprint and AT&T for the 16 GB iPhone 4S and $100 for the iPhone 4. Unlike those subsidized phones, which require two-year contracts, Cricket's iPhone will be available contract-free for $55 a month, with unlimited talk and text. Cricket also offers "unlimited data," but the company will start slowing speeds down to a crawl after a user reaches 2.3 GB in a billing cycle. The comparable iPhone plans available on the bigger carriers range from $70 to $80 a month. Cricket estimated that the average iPhone customer under contract pays $2,775 over the course of two years, including the upfront cost of the device. It estimates that its own customers will pay $1,719 over the same period. The trade-off is a less robust and more geographically limited network. Just 60 million Americans are covered by the Leap wireless frequencies that the iPhone supports, compared to upwards of 275 million on the other carriers. Cricket's broader network covers more than 90 million Americans, so not all of its customers will be able to buy the iPhone at launch. Cricket is the sixth U.S. cell phone company to carry the iPhone, following AT&T (T, Fortune 500), Verizon (VZ, Fortune 500), Sprint (S, Fortune 500), Mississippi regional carrier C Spire and Virginia regional carrier nTelos (NTLS). But Cricket is the first low-cost, prepaid carrier to offer what has been considered the highest of high-end smartphones. "Launching iPhone is a major milestone for us," said Doug Hutcheson, Leap's CEO, in a prepared statement. Pre-paid is a huge, fast-growing market that Apple hasn't played in so far. Though many smartphones are available on pre-paid plans, the field is dominated by Google's (GOOG, Fortune 500) lower-cost Android platform. The decision to sell the iPhone is a financially fraught one for most carriers. It's the most popular smartphone among consumers, but it comes with the heftiest upfront subsidy to get the cost to customers down to $200 (or $150 on nTelos). That money goes directly from the carries' pockets into Apple's -- and it can decimate their bottom line. Leap is dodging the problem by passing the iPhone's costs straight on to its customers. On a conference call with analysts Thursday morning, Hutcheson called the subsidy it will pay to Apple "modest." Over the next three years, Leap has committed to paying Apple just $900 million. By contrast, Sprint's five-year deal with Apple will cost Sprint $15.5 billion. Leap said it expects the iPhone to make up just 10% of its overall Cricket sales, partially due to the higher-than-average monthly rate. Cricket currently offers a $25 per-month plan and a $35 plan, so the iPhone's $55 per-month cost is much more expensive than the other devices Leap sells. But where the iPhone is sold, customers come flocking, Hutcheson said. He rattled off a series of "key advantages" to carrying the iPhone, including the "halo effect," lower customer defection rates, and the ability to draw in customers that otherwise would have only considered bigger rivals. Shares of Leap (LEAP) rose 2% following the announcement, to $5.89. Now that Cricket has gotten the iPhone, that leaves T-Mobile, U.S. Cellular (USM) and MetroPCS (PCS, Fortune 500) as the remaining top-seven carriers without the iPhone.